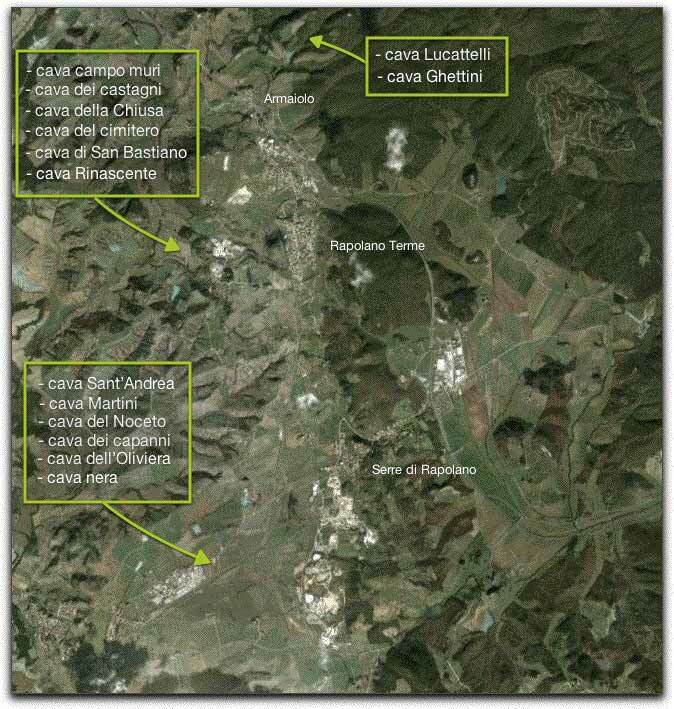 Images of the mining areas in the territory of Rapolano Terme. The project tradere tries to reconstruct the history of the caves and their location in the territory. It has many memories but they do not find it obvious traces; existed many small caves, often family-run, which were used only for local requests and occasional (steps, cornices walls, troughs for farm). But even large caves, those of Serre di Rapolano, are today as a single and continuous excavation area but are the result of a gradual disappearance of small and separate slots, each with its own name and its type of travertine. Reconstruct the location on a map would be impossible today if there had been the practice of calling the cave with the name of the nearest farm. So the Noceto quarry was near the Noceto farm, Oliviera quarry is under the farm Oliviera. Of the many images of the areas of excavation collected and cataloged here we have tried to identify the quarry, or the area of the cave that was documented. But the landscape of a quarry is constantly changing: every day you can say that it looks dumb because delal excavation and displacement of waste material. This is particularly evident after the 50s with the advent of machines that can greatly accelerate the process of cutting and handling. Whenever possible, we used therefore references still exist mainly outside the quarry to give an approximate location to the area documented in the image. In the photograph on the left mapping of quarries disappeared and those that are still in business.